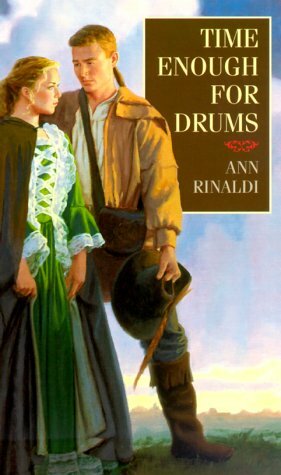 Ann Rinaldi has become a household name in YA historical fiction, and this is one of her most acclaimed books. It’s been on my reading list for some time. The year is 1775, and fifteen-year-old Jemima Emerson is a headstrong young lady. She’s not a bad child; she simply doesn’t think before she acts, and Mr. John Reid, her tutor (and a hated Tory), is determined to turn her into a lady. She resists with everything she has. But war has a way of making one grow up. Jem’s brother, Daniel, fulfills a commission under General Washington. Her merchant father sacrifices much to supply the army. Her mother writes essays under a pseudonym that appear all over the American colonies. And her boyfriend, younger brother, and servant all leave to fight. Her sister moves away and marries a British officer. All these events have consequences. Then the dangers of war come directly to Jem’s home town of Trenton along with the occupying British army. In the meantime, the tutor Jem so despises ends up being more than he seems. This is a tremendous coming of age story that takes place during the American Revolution, one of my favorite historical time periods. There were so many forces at work, so many players, so many changes, and so much at stake. It’s fascinating! Ms. Rinaldi does a tremendous job boiling it all down and illustrating how all those factors came to affect one family. And the independence theme comes through loud and clear, both on a national level and a personal one. Ms. Rinaldi’s greatest strength, however, is the strong characters she creates. Jem is a complex girl living in a complex time, and John Reid is the perfect counterpoint for her. Just like Jem, I couldn’t stand him at first. But the interaction between them kept me turning pages, even if the romance that develops between them was a bit predictable. Their strong bond serves to emphasize the horribleness of war. I would rate Time Enough for Drums in the 12+ YA category because of that same horribleness. It’s not overwhelming, but it’s all-encompassing. War is always terrible, and in this case, the details are probably best left to an older audience. It also has a few mild profanities. Highly, highly recommended historical fiction. This sounds like a great read. You know I like this period in history! As always, I enjoyed your very thorough review. Did you review Sophia’s War by Avi (also a revolutionary book)? I reserved it at the library some time ago and can’t remember who recommended it. I thought of you, but it didn’t come up in your “search.” Also looks like a great read. That’s a new one to me, by one of my favorite authors! I’m getting it! The cover just screams “Colonial period,” doesn’t it? Ann Rinaldi is always fabulous, but this is the best one of hers I’ve read.